Have you started on any home projects yet this year? I’m filled with ideas and inspiration for things I want to change in the house over the next year once I find some time… and some extra money. Many of us, I’m sure, are still being careful with our pennnies following the Christmas spending season but I’m bookmarking some ideas for later in the year for when the bank account is more buoyant. There are ways to do up your home for less though. I have been making a few changes in a few rooms without spending a fortune. There are loads of things you can do that don’t cost much but will still allow a room to feel fresh and new. Styling your home on a budget is much easier than you think, and there are lots of tips and tricks you can use to give your home that makeover it deserves. Following weeks of hibernating in the house (don’t we all do this in the depths of Winter) I’ve started to feel the living room is a little dowdy. It was lacking any colour, any vibrancy or warmth and felt well…. a little flat. So, time to inject some much needed brighter hues. One of the things I love to do is move things round a little. The wallpaper is purple stripes and the accessories were all very muted. Time for colour in the shape of some very jazzy yellow and grey cushions, some of which I had lurking in another room. Raiding the loft I found a few purple cushions that would work well so I started to play around with the layout. A little trip to my local Homebase and I had a few more Habitat (they are stocked within the store) cushions and a very cheap, but large hurricane lamp. The one thing that I knew would really change the look of the room was a fresh rug. Now rugs aren’t cheap normally but you can hunt around for a bargain and see what you find. 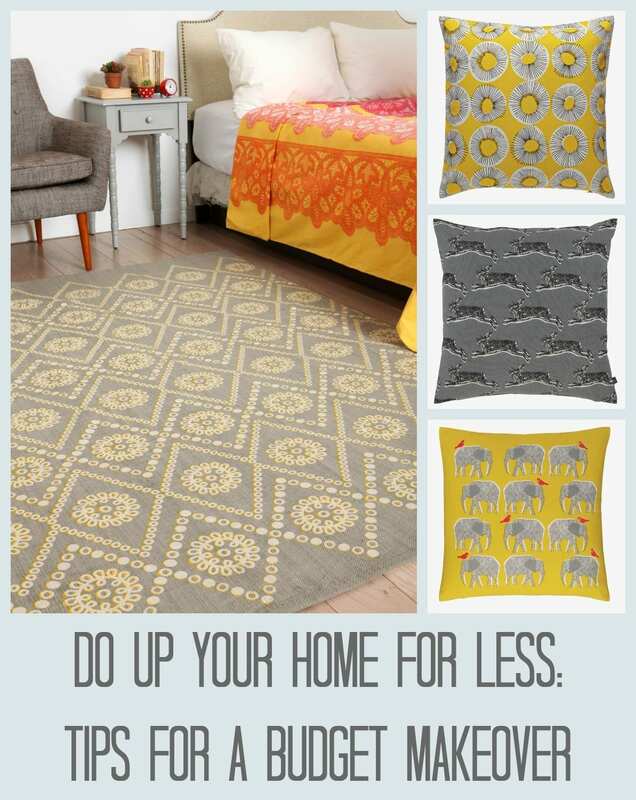 Luckily I found these fab rugs on Urban Outfitters, with thanks to Tidy Away Today for the tip. 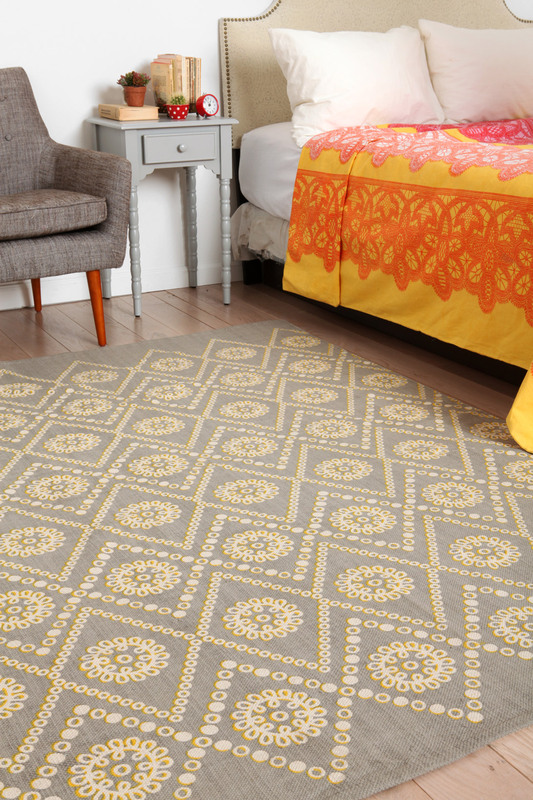 In the sale I found this lovely cotton rug in greys and yellows that I knew would work brilliantly with the yellow cushions and add a quirkier feel to the room as a whole. Luckily there was a 20% off deal on top of the sale giving me the fabulous price of just £40 for a good-sized rug. For the fashion conscious and home lovers amongst you it’s always worth checking out what you can get from Voucherbox too. Adding a voucher code for your favourite shop is a great way to grab a January bargain. So my living room mini makeover is complete and I couldn’t be happier. The whole thing cost just over £50. Bargain. Have you found any home bargains recently? Woah I would not have guessed that came to only a little over £50 including the rug! So simple but such cheerful colours and accessories to brighten up the room. I really want to makeover my bathroom, it’s looking very tired. I am loving the bunny cushion. Great ideas here and you haven’t spent much either Bargain! Woah, loving that rug, can’t believe the price. I always love the urban outfitters designs but I’m yet to buy one. Very tempting. Wow, rugs from Urban Outfitters is a GREAT tip. Just been browsing and pinning their selection. Thanks for sharing!